Dolphins running back Frank Gore speaks to the media during Dolphins OTA’s at the Dolphins Training Facility in Davie, FL, on Thursday, May 31, 2018. Back in 2014 I was part of a small family league where running backs took up the majority of the first and second rounds of the draft, sans a homer Tom Brady pick sprinkled in. And that was a typical trend back just 4 years ago. That year, players like Antonio Brown and Odell Beckham Jr. exploded and the shift to wide receiver heavy drafts began. But the last two years we started seeing that shift yet again as a new wave of fresh, talented running backs entered the scene. 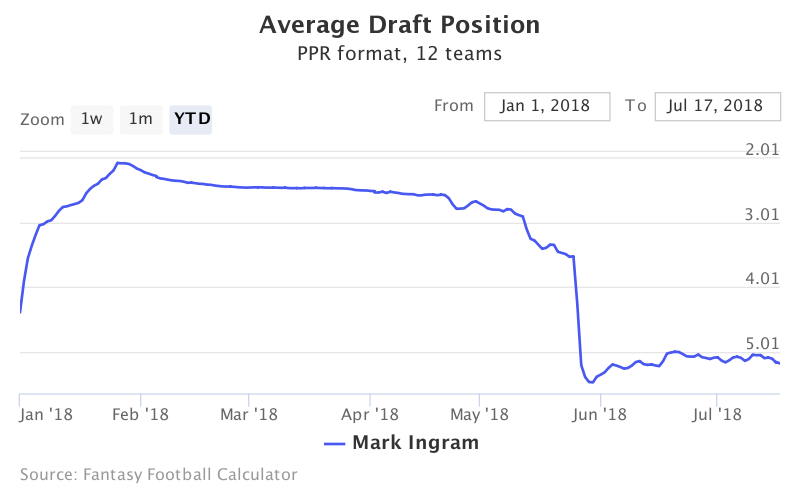 Currently there are four running backs in the top 4-5 picks and if you don’t snag one of those you may be disappointed. But don’t fret, focus on grabbing top tier wide receivers and look out for these running backs who could help you win your league if you miss out on that first tier of running backs. This pick may seem obvious, but the eye test last year left something to be desired when watching Fournette. He faced stacked boxes and had trouble breaking through that second level of the defense, especially in the second half. 2018 is a new year and I’m optimistic Leonard Fournette can make strides in his second year. He’ll have a full year in the system, a better understanding of the grueling schedule, and hopefully a stronger training program. The defense should make it easy for Fournette and company, keeping them playing from ahead more often than not and allowing the run game to be established early. Bortles is a great game manager and slowly seems to be coming in to his own but the wide receiver core is still subpar with the loss of Robinson and Hurns which should give us some pause. The Jaguars offensive line is a top line in the league which should provide bigger holes for Fournette to squeeze through and his schedule against 2017 run opponents is good. He’s not going to go early in round 1 so if you are sitting at the end of round 1 and early round 2 he could be a great addition to your team. Yes he’s suspended 4 games and no Alvin Kamara isn’t injured or traded, so why in the world would I place him on this list? But now, after his suspension? 5th round. Granted you can’t use him for the first four weeks of the year, but that still leaves 12 weeks including the playoffs. He still plays for the saints, who have Drew Brees at the helm, and he still produced last year in a committee with Kamara. And the big keys are still there as well, the saints offensive line is elite and his schedule is good in those 12 games facing the likes of the Redskins, Bengals, Bucs, and Steelers. If you can get a top tier talent at a steep discount like this, do it. The buccaneers backfield may be one of the most open backfields in the league this year as the season starts. Doug Martin is gone and Jones’s chief competition is Peyton Barber and Jacquizz Rodgers, not names that jump off the page to be drafted by the likes of anyone. 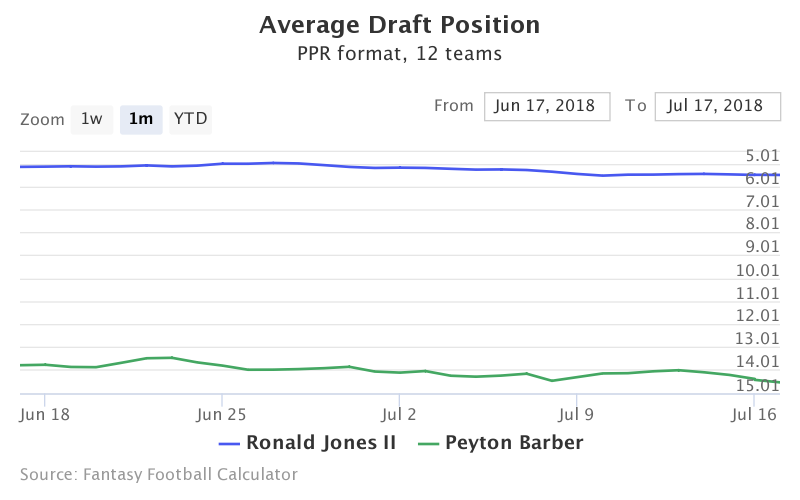 Peyton Barber is going largely undrafted(round 15) while Jones is going in the mid 5th round, showing that even the publics perception of the situation is that Jones will win the job. This isn’t necessarily a sleeper that’s going to end up in the top 15 this year but Jones is someone who could see consistent usage and generate stable points. What does give me pause is Tampa Bay’s middle of the road offensive line as well as a team without its quarterback the first three games of the year. The Bucs do see a fairly mild schedule for 2018 adding to the attractiveness of drafting Jones in the middle rounds. The early consensus is that Royce Freeman will win the starting job out in Denver but I list both he and Devontae Booker here because I believe Booker still has allies in the Broncos front office that are going to make sure he gets his shot. Coming out of college 2 years ago there were plenty of fantasy football analysts who believed Booker could be the guy in Denver but with CJ Anderson in the picture it never came to fruition. Booker will have a leg up, having a year in Vance Josephs system, and most likely get the first opportunity to earn the lead role. Royce Freeman has better hands than Booker and was an exceptional producer in college. Another back hand picked by this regime could mean Booker is on the ropes, or it could mean they wanted another back with Anderson leaving for the Panthers. Whatever the case, Freeman will also have his chance to win the starting job. This backfield is another one that is wide open with a lot of available carries. With the addition of a stronger quarterback and a decent schedule there is valuable production to be found here. Their offensive line is ranked as poor, however, they are young and with another year together and a better signal caller who can size up defenses quicker they should make positive strives giving Booker and Freeman a chance to shine. The Dolphins have a nice schedule that should keep Gore and company on the field. Kenyan Drake is going in the late 4th round while Gore is going largely undrafted and that’s a mistake you should take advantage of.